A former Daviess County Sheriff’s Deputy is scheduled to be in court this afternoon to answer to new charges filed against him while he was in jail. 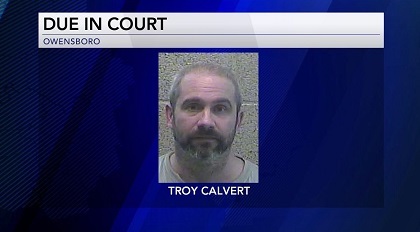 Investigators say Troy Calvert was plotting to kill his wife upon release, with all of the evidence recorded on a jail phone. Calvert is expected to be arraigned on a charge of retaliating against a witness in the legal process. Two years ago, Calvert was fired from the Sheriff’s office for violating a protective order that was put in place to protect his wife. According to court documents, Calvert made the most recent death threats while serving a 180 days sentence for, once again, violating that protection order. He will appear in court at 1:00PM.